Chop for parrots is the easiest method of introducing picky eaters to new, healthy foods. Chop for parrots is simpler than you ever imagined: Faster and easier even than grain bakes. As you may guess from this post, I, too, am a chop convert. I first learnt about chop through the Parrot’s Pantry on Facebook some time ago, and again, later, through Parrot Nation. I’d experimented a little with making it by hand, without much luck. 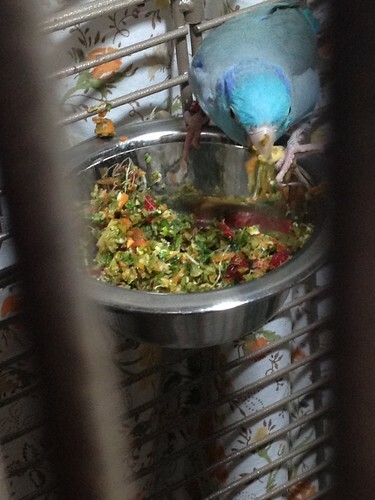 Then my parrots came home from quarantine, and magic – that food processor made all the difference. Your eyes do not deceive: this is a photo of a parrotlet eating chop. Chop is a healthy food for parrots, and should (between pellets and other fresh foods) make up the majority of the diet for most species. My super picky parrots will gladly tuck into a bowl. It’s freezable – you can store it bagged up or divvied into ice cube trays for several months in your freezer. Each day as you need some, simply take out a portion and thaw overnight. Heat it for eight seconds or so in the microwave before serving, and there you have it. Fresh food on the go. Just be sure to check how warm it is before serving! Finished chop – batch A.
I judge the success of a meal by two factors: How quiet the birds go, and whether they watch me as I work in their cages or move about the room. Really, really good meals mean they don’t look up at all. TIP: Instead of adding all the ingredients, I like to make a chop ‘base,’ which I freeze or store on its own. My base involves maybe 8/12 of the ingredients I intend to add (I’ll give you an example recipe below). As the days go on, I can individually dice, slice, or mash different ingredients in, spicing it up and adding a little variety. My flock are like most birds – they don’t enjoy eating the same thing too many times in a row, and will refuse it entirely if I dare offer a food too often. By leaving out some of the ingredients and adding new things in fresh, daily, I make sure the chop stays exciting to them. Chop for parrots is a concept, which is what makes it so brilliant – but also intimidating for those who have never tried it before. There are no set recipes. Just ideas. As with a grain bake, you can customise it so your parrot gets whatever it needs or likes most at the time. Vitamin A deficient? Add some pumpkin or baked sweet potatoes. Does your parrot hate, broccoli, and red pepper, etc.? Mix those ingredients in with some of his or her favourites, and some will end up getting eaten. What goes into chop for parrots? Answer: Just about any bird-safe food that can be ground up in a food processor. I store it unfrozen in the fridge for up to four days. TIP: Fruits and watery vegetables (such as zucchini or cucumber) are not ideal for freezing. They can make your chop watery when you thaw. These are the kinds of things I like to leave out of my ‘base’ and add in later. Some also recommend cutting these by hand and adding them to your freezable mixture, so that it doesn’t water it down. Keep it dry! That was my base. I chucked in some of everything – a lot of people add in tons of fruits and vegetables, a ‘whatever is in the fridge and pantry’ kind of deal to use up ingredients. As each day goes by, I add one or two extra ingredients to the individual bowls. For example, day 1: Diced strawberry. Day 2: Lemon slices and blackberry. Day 3: Hard-boiled egg. Day 4: Yellow squash. Day 5: Chopped zucchini and a spice. Many days, I’ll add in a different spices to the individual bowls (not the whole batch). I’ve been known to use cinnamon, small amounts of mint, basil, or hot pepper flakes, for example, to make the meal taste entirely different to the previous serving. TIP: I mix hemp seed into the chop to get my parrotlet to try it, as it is healthy (in moderation) and he loves it. As the days pass, I lessen the amount of shelled hemp going in, but still leave the tiniest bit on top and mixed throughout. As he tries to pick it out, he ends up eating more than he plans. Eventually, this has resulted in him just eating the chop! You can do this with any favourite food. These are homegrown sweet potatoes! Get a big bowl to mix everything up in. Start grinding. I do the greens first for some reason. I like to add sprinklings of hemp as I go. Time to prepare for freezing. Ice cubes trays work brilliantly. Tupperware tubs work moderately well. Label everything with batch and date. Plastic baggies work great, too. Investing in a vacuum packer may help. If you’re stuck on what to put into your first batch of chop, you can get a few ideas below. Think about colour. Green and red and yellow and orange – this makes a meal interesting. What do you like to cook with, eat, or feed yourself? Choose some green veggies, some orange, some yellow. There is no limit to what can go into your chop. Kale, spinach, broccoli, mustard greens, cilantro, bok choy, red lettuce, watercress, collard greens, radish and radish tops, carrot tops, endive, beets and beet tops, turnip, parsnip, rutabaga, Romaine, Swiss Chard, zucchini, winter, summer, yellow, or butternut squash, pumpkin, sweet potato, sprouts, bell peppers, hot peppers, grains like quinoa, barley, oatmeal, and wild rice, cooked beans, whole-grain cooked pasta, fruits like apple or pear, etc., etc. Thank you to Parrot Nation Blog and the folks at the Parrot’s Pantry – my picky parrots eat wonderfully thanks to you! I may have the only bird in the world who doesn’t like Chop. I think it was the broccoli. I’ll have to try again without it. He has a sweet beak: Loves fruit, especially blueberries, apples, mangoes, and his favorite, NANNERS! Even the vegetables he prefers are on the sweet side, like yellow peppers. Ooh, Ptak has sweet beak too… It took a full year before he even tried the chop. I had put him in our cockatiel’s cage, and he ended up trying some of her fruit and vegetable medley because he thought he was getting away with something, haha. Have you hand-chopped any fruit into chop? This works for us pretty well. It can be really frustrating, as sometimes the whole batch ends up dropped out of the bowl. the food looks yummy, I have a question though, your yellow bell peppers seem to be very expensive, is it really USD4- for only 2? Yes! It is really expensive. We grow our own, mostly, but it’s too cold to have fresh produce right now. 😦 How much is a pepper where you are? USD4- perhaps I could get 5-6 yellow bell pepper!! I have been blessed with my B & G macaw Taz. He will happily eat the same food for 4 or 5 days without complaint. He loves pasta, all kinds of pasta/ rice/ beans. I cook his pasta/rice mix, adding whole veggies which he can break down with that big beak. He likes everything cooked and seldom eats raw veggies, unless one or two I am eating and will share with him. It’s a bonding thing I think. But this article has some great ideas I can borrow from to freshen up his menu. Thank you for posting this. I love the whole veggies method! I even give huge pieces to my smallest birds. Make ’em work, haha. Chop is a great way to get him to try raw stuff, especially if, as you say, you eat some too. Works like a charm! Thankbu very much for so much sharing…really help a lots.. Thank you! I’ve acquired my mom’s quaker and he needs some variety in his diet. This was spot on in explaining how introducing new healthy foods could be. I don’t see corn on any of the lists – is it a good vegtable or a bad vegtable? Corn could be mixed in on an occasional, individual day, but it’s a starch – so probably best used as something to spice things up, rather than a staple used in the whole batch. Same with figs – they’d be sugary, but fine for a treat once in awhile (dried especially does things to the sugars). WOW… how informative! You r so awesome to have taken so much time to teach us(including myself) “not do diligently healthy feeders” that really want to do better! Thank u so much! 1 question..do u feed any pellets/seeds or vitamin supplements? Or are they getting what they need from chop & daily added fruit/veggies? My birds get pellets and seeds, and I’ve got a new water vitamin mix to try. The vitamin mix recommended by my vet to supplement what they’re missing from food. I also want to move away from seeds even more, and go to majority pellets/chop (conflicting research on this – still trying to figure it all out!). provide such priceless info to we Bird Lovers. CHO CHO, my beautiful, brilliant African Grey lady. What size should each daily portion be for a single bird? I might have missed it but do you feed any seed mix?